FILE - North Korean Leader Kim Jong Un reacts during the test-firing of an intercontinental ballistic missile in a photo released by North Korea's Korean Central News Agency (KCNA), in Pyongyang, July, 4 2017. North Korea has so far not responded to a South Korean offer made earlier this week to engage in military talks. “The Defense Ministry urges North Korea to immediately respond to our proposal once again,” said South Korean Defense Ministry spokesman Moon Sang-kyun on Friday. South Korean President Moon Jae-in, who took office in May, has advocated a dual track policy to resolve the North Korean nuclear stand-off by supporting U.S.-led sanctions against the Kim Jong Un government, but also increasing inter-Korean dialogue and assistance where possible. The Defense Ministry in Seoul proposed holding talks with Pyongyang on Friday to reopen the military channel between the two countries to reduce the potential for miscommunication and miscalculation at a time when tensions are high over the North’s continued testing of nuclear weapons and ballistic missiles. It was the first formal overture by South Korea since cross-border ties broke down early last year under the government of Moon's predecessor, who imposed unilateral sanctions on the North for its nuclear tests and missile launches. ​But so far North Korea has ignored or rejected not only this request for military talks but also a proposal to hold a reunion of families separated since the Korean War, and offers of humanitarian aid. 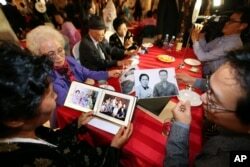 FILE - Family members from South Korea and North Korea share family photos during a Separated Family Reunion Meeting at the Diamond Mountain resort in North Korea, Oct. 24, 2015. Similar reunions have been halted, with Pyongyang rejecting offers by Seoul to resume them. There had been speculation and concern that Seoul might offer unilateral concessions such as suspending loudspeaker broadcasts at the border that are highly critical of the North Korean leader to re-establish contact. “South Korea may end up giving up too much to North Korea without receiving something in return,” said political analyst Bong Young-shik, with the Yonsei University Institute for North Korean Studies in Seoul. But North Korea’s state-run newspaper Rodong Sinmun, on Thursday called the South’s outreach efforts “nonsense” and indicated that inter-Korean relations will not improve as long as Seoul supports sanctions against Pyongyang. China has proposed that the United States suspend joint military exercises with South Korea in exchange for North Korea putting on hold further nuclear and ballistic missile tests. Neither side has agreed to this proposal, but Moon indicated he would support resuming the jointly-run Kaesong Industrial Complex and Mount Kumgang, projects that generated millions of dollars in revenue for the North in return for a nuclear freeze. Moon’s outreach has so far not only been rejected by North Korea, it has also raised concerns with South Korea’s main ally, the United States, which is working to increase sanctions to pressure Pyongyang to give up its nuclear program. 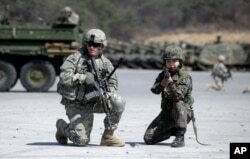 FILE - A U.S. Army soldier and a South Korean Army soldier take their position during joint military exercises between South Korea and the United States in Pocheon, north of Seoul, South Korea, March 25, 2015. China has proposed that the United States suspend joint military exercises with South Korea in exchange for North Korea putting on hold further nuclear and ballistic missile tests. Advocates for strong sanctions worry that President Moon’s outreach will only undermine international pressure. “This just by definition gives the North some breathing room and the potential for splitting the coalition against itself,” said regional security analyst Grant Newsham with the Japan Forum for Strategic Studies in Tokyo. At the U.N. Security Council, the United States has called for stronger sanctions against North Korea for its July 4 test of a possible long-range intercontinental ballistic missile (ICBM). However, Russia has reportedly blocked the measure saying the recent test was not an ICBM but a medium range missile, and did not warrant further punitive action. The U.S. Congress is also working on a bill authorizing secondary sanctions on international companies and individuals that do business with North Korea, particularly in China where over 90 percent of trade with the North takes place. 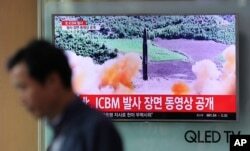 FILE - A man walks past a TV screen showing a local news program about North Korea's firing of an ICBM, at Seoul Train Station in Seoul, South Korea, July 5, 2017. The launch has prompted the U.S. to call for stronger sanctions against Pyongyang. Also on Thursday the new director of the Central Intelligence Agency, Mike Pompeo, indicated the United States' ultimate goal is to remove Kim Jong Un as leader of North Korea. "It would be a great thing to denuclearize the peninsula, to get those weapons off of that. But the thing that is most dangerous about it is the character who holds the control over them today. So from the administration's perspective, the most important thing we can do is separate those two, right?” said Pompeo at a security forum in Aspen, Colorado. The CIA chief said the intelligence community is preparing a range of options to end the North Korean threat. His comments seem to contradict statements by U.S. Secretary of State Rex Tillerson who said in May that the U.S. does not seek regime change in North Korea.